1. Jimmy G. is on schedule. 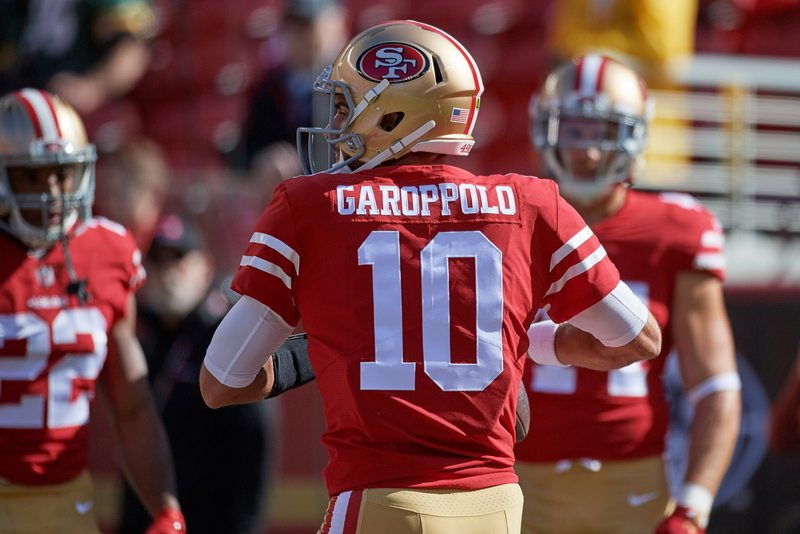 From the 49ers perspective, the availability of Jimmy Garoppolo did come out of nowhere. But their interest in him didn’t. It was there in March when they asked the Patriots and were quickly shot down. And even before then, the guys running the football operation had No. 10 clearly on their radar. Right after the Super Bowl, and days after Kyle Shanahan first arrived for work, the new coach was given the floor before new GM John Lynch and the scouts. “Kyle was in our draft meeting and giving a long presentation on ‘this is what I’m looking for at every position,’” Lynch told me in the days to follow. Shanahan used cutups, and the idea was for the scouts to take the skills the players on the screen were showing, and project whether potential acquisitions were capable of similar things. But during one position presentation, one player kept showing up. It was Garoppolo, and this was despite the fact that Garoppolo was playing in a totally different offense. That’s why Lynch first made a run at him, and why he never gave up on the idea. Shanahan, in those presentations, planted the seed, and now the Niners have their fit for the position. So where is Garoppolo now? To this point, he’s lived up to the reputation he had coming out of New England, and that was of a hard-driving worker with an easy leadership style who’s popular with his teammates. The football part is coming along. While there is some Patriot/Niner carryover in the dropback passing game, the terminology, checks, play-action and run scheme in Shanahan’s system are wholly different than what Garoppolo’s accustomed. Could the coaches put him in position to be functional out there now? Sure. The real problem is that the Niners offense is ravaged with injuries, and so putting the new QB out there early probably wouldn’t put him in much of a position to grow out there. That’s why giving the team the bye to get healthier, and Garoppolo the extra time to learn, makes sense now. As Shanahan said last week, he’s not there to save this season. 2. Rams receivers coming together quickly. Quarterback Jared Goff and coach Sean McVay are getting most of the credit for the Rams’ 6-2 start, and rightfully so. They deserve it. But the job the team has done completely blowing up its receiver room—and getting the new guys ready to go right way—may be just as impressive and impactful. Gone are Kenny Britt and Brian Quick. And in are Robert Woods, Sammy Watkins and Cooper Kupp. All three of the new guys are producing on a whole new level, averaging better than 14 yards per catch, with eight touchdown catches between them. Their presence has given McVay and the coaches the opening to use Tavon Austin—who has 31 carries and just 7 catches—in a much different way. And the Rams, to be clear, knew they’d have to do this coming out of 2016, even before they hired McVay. When the new coach, and his staff, arrived, GM Les Snead sat down with McVay, coordinator Matt LaFleur, receivers coach Eric Yarber and assistant receivers coach Zac Taylor, and went through the strict parameters that McVay’s system required of receivers. As much as anything else, the coaches wanted guys with sure hands and the head to be in the right spot consistently, and also players who complemented each other. Snead has likened it to putting together a basketball team in making the pieces fit together. So in Woods, they got their crafty route-runner with deceptive speed who could play inside and out. In Kupp, they got the bigger slot who could run after the catch. And that left the last piece: a height/weight/speed threat who could track the ball downfield. That one’s harder to find, and why the Rams had to be patient before pouncing on Watkins early on in training camp. Before those pieces even fell into place, all the way back in minicamp, McVay was telling people in the building, “We’re gonna be able to score.” Even with all the new additions, because football IQ was a priority, absorbing a challenging offense quickly was possible. The proof is in the 6-2 start. And yes, part of it is Goff and how McVay’s made everyone more efficient. But getting the right guys to play those receivers spots, while swapping out Britt and Quick, has been a major factor. 3. Gordon back in Cleveland. Will he stick? If you haven’t read the GQ interview with Josh Gordon, go … now. It’s a pretty chilling, vivid look at how off the idea was that he was just a dumb pothead. Can Gordon stay clean this time around? He’s been suspended for 51 of 56 games since finishing 2013 with 87 catches, 1,646 yards and nine touchdowns in just 14 games, and so it’s more than fair to be skeptical. And the truth is, this may come down to the support system around him. Four years ago, during that breakout year, the Browns put just about every failsafe you could imagine around him. Cleveland’s brass, headed by Joe Banner, brought in performance psychologist James Bell and Cleveland Clinic psychiatrist Mayur Pandya that year to work with a number of the team’s troubled players. And those two, plus offensive coordinator Norv Turner, receivers coach Scott Turner, and head athletic trainer Joe Sheehan were able to build trust with Gordon. So how’d they do it? They were clear, and they created a level of accountability. And they stayed on top of him, constantly making sure he was on time and ready to go. If that sounds like babysitting, well, then maybe that’s what it was. But none of this was done because Cleveland management thought he was a bad guy; it was because they thought there was a good guy in there who was lost. As it turned out, he stayed lost for quite a while longer. Gordon will tell you now that he’s finally found himself. The above should tell you that it’ll be important for the Browns to put the right infrastructure around him to keep it that way. 4. Giant missteps. ESPN’s Josina Anderson reported Wednesday on what it seemed we could all see plainly in the Giants’ unsightly loss to the Rams last Sunday: Ben McAdoo is losing his team. She’s right. One source called him a “hall monitor”, and the scene at MetLife on Sunday told the rest of the story. The stands were well under half-full, the weather was dreary, and the players, coming off their bye, packed it in quickly when it became apparent that a Rams team traveling cross-country to play a 10 a.m. body-clock game was coming with the thunder. And all of that was just a symptom of the full-blown sickness that has overcome the program. I’ve made my point here on Odell Beckham. McAdoo was permissive of him gallivanting off to South Florida during a playoff game week, taking his receiver room with him, and waving it in everyone’s face on social media—before vanishing in the game itself. The coach made excuses for him when he missed the entire offseason program, and flaunted it in the staff’s face on Twitter. And when the fall came, things only got worse. McAdoo took Eli Manning to task for taking a dumb penalty in a Monday night loss to the Lions in September, trying to draw the line and send the message that everyone’s accountable. And six days later, McAdoo said he wished everyone would focus on the plays Beckham was making when he was asked about the dog-peeing celebration, completely undermining the message he was trying to get across post-Detroit. So it makes sense that Dominique Rodgers-Cromartie and Janoris Jenkins stepped out of line and got suspended, the same way it did when owner John Mara had to be the one to give Beckham a talking to after the Eagles loss. Those in the building have taken note of all this, of course, and the fact that McAdoo doesn’t have relationships with his players or the ability to command the program has become increasingly obvious as the ship has gone careening into an iceberg. It’s hard to see the Giants, based on their history, firing a coach after just two seasons. But it’s becoming harder to see them going forward with the current leadership in place.